One of the biggest draws to buying Harley Davidson motorcycles is joining a fraternity of bikers that enjoy the best in quality bikes. Furthermore, you will have access to many Harley Davidson accessories like Harley Davidson clothes and Harley Davidson boots, which will help you look the part. While there are many accessories available, the most important item you will buy is a helmet. 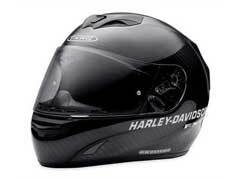 Harley Davidson helmets come in a wide variety of styles to suit drivers’ head sizes and design tastes. One of the bigger draws is their helmets with intercom as it allows you to listen to music, communicate by way of microphone and access to your navigation systems. This is an incredibly convenient way to access all of your electronic equipment as it’s handsfree device. How it works is you buy Harley Davidson helmets that are equipped with the Harley Davidson intercom and Bike-to-Bike communications equipment as this will give you the ability to use this system. As the intercom, speakers and microphones fit onto the helmet you will receive excellent sound quality while reducing road noise. There is a quick disconnect plug that allows you to walk away without removing your helmet. Best of all, the microphone placement is effective as it provides great clarity. For the design and ease of use this is an outstanding feature of Harley Davidson helmets as it provides riders with better flexibility in accessing their systems. Best of all, you can stop by a dealer and have everything set up quickly. Additionally, Harley Davidson helmets are some of the best made on the market. They come in different types including half, open face or full face. Further, they are made with durable materials like hybrid fiberglass composite, which can keep you safe and they are designed for comfort with liners that keep your head cool and dry. The only drawback to these helmets would be that it isn’t for everyone. This is a great device that is perfect for the more seasoned riders. However, for beginners learning to navigate their first hog this will likely serve as a distraction and won’t be beneficial. Therefore, if you have a firm command of your bike and are looking for an easy way to access your systems this is the ideal buy.